In order to develop excellent photonic devices, we have to fully understand the physics behind operations of photonic devices. This book thoroughly teaches the fundamental physics currently applied to the development of photonics devices such as energy bands of semiconductors, optical transitions, optical waveguides, and semiconductor junctions. The book also reviews the characteristics of laser diodes, optical filters, and optical functional devices, which have been developed based on the above physics. These photonic devices have been demonstrated in system applications, and several experimental results are described. TAKAHIRO NUMAI, PhD, is Professor at Ritsumeikan University. Previously, at Opto-Electronics Research Laboratories, NEC Corporation, he researched and developed laser diodes for lightwave transmission systems and wavelength tunable optical filters for photonic switching systems. 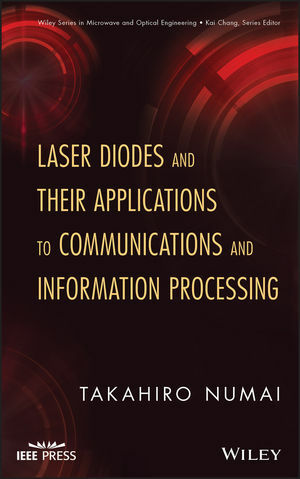 Dr. Numai holds twenty-eight U.S. patents, and he has authored and coauthored more than 150 technical papers and international conference communications on optoelectronics. He has also written many textbooks. Dr. Numai is a member of the Institute of Electronics, Information, and Communication Engineers of Japan; the Japan Society of Applied Physics; and the Physical Society of Japan. He is also a senior member of the Optical Society of America (OSA) and the Institute of Electrical and Electronics Engineers (IEEE). PART I PHYSICS REQUIRED TO DESIGN LASER DIODES. 1 Energy Bands in Bulk and Quantum Structures. 2.2 Direct and Indirect Transitions. 2.4 Spontaneous Emission, Stimulated Emission, and Absorption. PART II CONVENTIONAL LASER DIODES. 6.3 Current versus Voltage Characteristics. 6.4 Current versus Light Output Characteristics. 7 Quantum Well Laser Diodes. 7.2 Features of Quantum Well LDs. 7.3 Strained Quantum Well LDs. 8.4 Vertical Cavity Surface-Emitting LDs. PARTIII ADVANCED LASER DIODES AND RELATED DEVICES. 10 Phase-Controlled DFB Laser Diodes. 10.4 Device Characteristics and Discussion. 11 Phase-Shift-Controlled DFB Laser Diodes. 11.4 Device Characteristics and Discussion. 12 Phase-Controlled DFB Laser Filter. 12.3 Device Characteristics and Discussion. 13.4 Device Characteristics and Discussion. 14 Passive Phase-Shifted DFB Filter. 14.4 Device Characteristics and Discussion. 15.4 Device Characteristics and Discussion. 16 Optical Functional Devices with pnpn-Junctions. 16.2 Edge-Emitting Optical Functional Device. 16.3 Surface-Emitting Optical Functional Device. PARTIV SYSTEM DEMONSTRATIONS USING ADVANCED LASER DIODES AND RELATED DEVICES. 17.3 Wavelength- and Time-Division Hybrid Switching. Appendix A: Density of States. Appendix B: Density of States Effective Mass. Appendix C: Conductivity Effective Mass.